MUA members lead our movements for justice and dignity. Collectively, MUA aims to realize the following vision. We work so that women are able to live with respect, dignity, and self-determination. We organize so that women’s paid and unpaid work will be respected and valued. We strengthen immigrant families so that the relationship between parents and children is healthy and immigrant children grow up feeling sure of themselves. We promote a better future for immigrant children and youth. We struggle to create equal access for all to high quality services, whether in the area of health, education, housing, or employment. 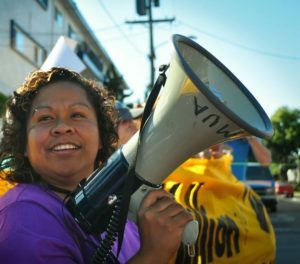 We seek a living wage and a safe working environment for all immigrant workers, especially women workers. We work to liberate society from domestic violence, war, and other abuses of power. We want an economic and political system that creates just conditions at the local and global levels so that no one has to leave their country in order to survive. We struggle for the freedom of movement for all; immigration laws based on respect for people; recognition of the tremendous contributions of immigrants; and the right to live free from violence. We seek solidarity amongst races and amongst people of different countries, cultures, and immigration status. We unite with diverse struggles, recognizing that when we unite we build power for everyone. We are proud to be immigrants. We celebrate our cultures and languages, we work to conserve them, and we recognize the beauty and value of who we are. Compassion that enables us to understand the situation of each woman with patience and comprehension and offer support and companionship without creating dependency or encouraging victimization. Respect for each individual’s differences, needs, and aspirations. We extend our respect to all beings and to Mother Earth and understand that we are all interconnected. Mutual Support which allows each woman to flourish by giving according to her capacity and receiving based on her needs. Self-Determination that enables each woman to make the right decisions for herself, live free from violence and discrimination, and have access to ample opportunities during the different stages of her life to achieve economic security, health and safety for her and her family. Learning at our own pace and level, developing new abilities so that we can excel as individuals and as an organization, and constantly reflecting and evaluating so as to improve ourselves and our work. Solidarity with all who suffer injustice, consciousness of our common struggles, and a commitment to work together to create a sustainable global community that respects human rights and sees our diversity as a collective strength. Transparency about organizational resources and decisions so that our members are able to participate in decision-making fully and knowledgeably.